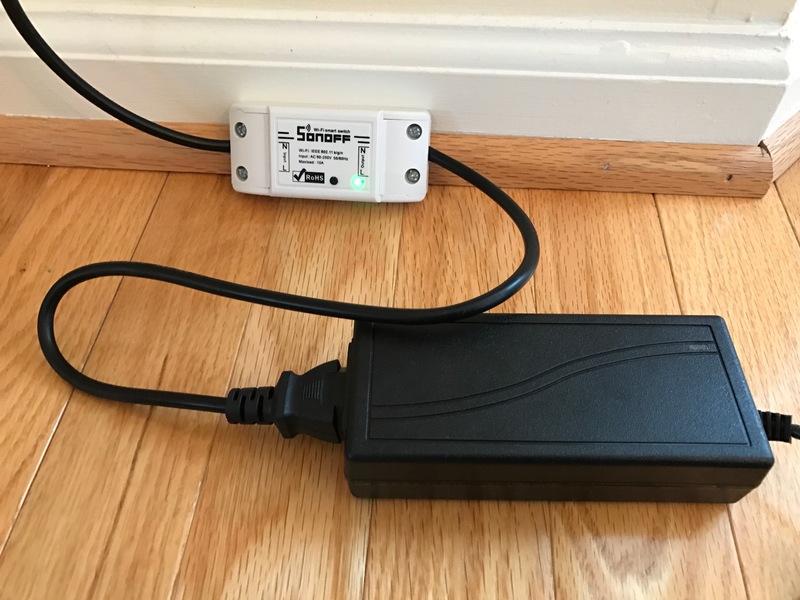 easyoutpetrelease.com | Release your pet from far away whenever you want by remote control, a timer, or even your SMART PHONE! Welcome to the Easy Out Line of Remote Pet Door Openers! THE EASY OUT REMOTE PET DOOR OPENER! CLICK HERE TO SEE IT FEATURED ON ABC WORLD NEWS NOW! SEE BELOW FOR MAIN PRODUCT INFO, BUT FIRST THIS BREAKING NEWS! MEET THE NEW EASY OUT DELUXE, NOW AVAILABLE WITH BUILT-IN WIFI! EXCITING NEW NEWS! BY POPULAR DEMAND, A NEW VERSION OF THE EASY OUT IS NOW AVAILABLE THAT CAN BE ACTIVATED ANY TIME, ANYWHERE, USING YOUR SMART PHONE!!! OR A STANDARD PLUG-IN TIMER! OR YOUR SECURITY SYSTEM, OR OTHER HOME AUTOMATION/SAFETY SYSTEM! CLICK HERE, HERE, HERE, AND HERE TO LEARN ABOUT THIS NEW “EASY OUT DELUXE”, INCLUDING THE AMAZING NEW 2017 MODEL WITH BUILT-IN WIFI SWITCH FOR SMARTPHONES/TIMERS!!! NOTE: WIFI SWITCH AND TIMERS ABOVE ARE NOT INCLUDED WITH BASE EASY OUT DELUXE, BUT PURCHASE OF WIFI MODEL INCLUDES BOTH CAPABILITIES! SHOWN BELOW IS A CLOSE-UP OF THE NEW BUILT-IN WIFI SWITCH! CLICK HERE TO ORDER AN EASY OUT DELUXE AS THE BASE MODEL, BUILT-IN WIFI MODEL, OR COMBO PACKAGE, OR CLICK HERE TO ASK THE INVENTOR ANY QUESTIONS YOU MAY HAVE ABOUT IT. CLICK HERE TO SEE HOW ONE CUSTOMER USED AND SHARED IT TO IMPROVE THE LIVES OF CHICKEN FARMERS EVERYWHERE! HE NOW RELEASES HIS CHICKENS EVERY MORNING VIA THE EASY OUT DELUXE AND A TIMER, SO HE NO LONGER HAS TO GET UP AT 5AM EVERY DAY! INTRODUCING A FUN NEW 1ST OF A KIND PET PRODUCT WITH MANY BENEFICIAL USES, THE EASY OUT REMOTE PET DOOR OPENER! 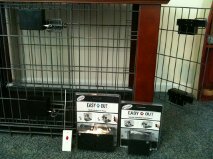 The Easy Out allows you to open your pet’s crate from several floors or up to 50 yards away with the simple push of a button on a small remote control. Upon pushing the button your pet will immediately nudge the door open and come directly to you! It works on wire pet crates, pens, etc. with lateral motion latches. It may also be easily adapted to transport carriers and many other applications by adding simple, inexpensive lateral motion latches! The Easy Out not only saves the pet owner time and effort, it also greatly enriches the pet’s life in several ways. First, they get to join their owners more quickly when their owners wake up, arrive home, or finish dinner! But in addition, they also experience a lot of joy and a sense of accomplishment from running excitedly to their master each time they are remotely released. 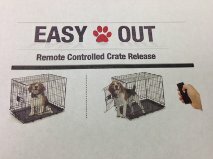 Finally, the Easy Out aids greatly in crate training, both for the reasons cited above and also because the pets can be released when they are calm, rather than when they are barking and scratching at the door upon seeing their master approach in the traditional manner… associating release with calmness, not rowdiness. These qualities make the Easy Out a “MUST HAVE” for anyone training a puppy or dog, both owners and professional trainers alike! As seen in the photo below, the Easy Out will work on doors that swing to the left or to the right. 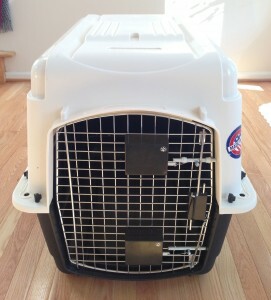 There are separate models available for crates that have 1 and/or 2 latches/door. Click here to watch a video on YouTube that provides an overall introduction of the original version of the Easy Out, complete with a live action sequence of the inventor’s own dog and puppy at home! Click here to see a video showing how a company that specializes in extra sturdy and super high quality dog crates/kennels teamed up with Easy Out Products to integrate the Easy Out into their line of products pre-installed from the factory as premium models! 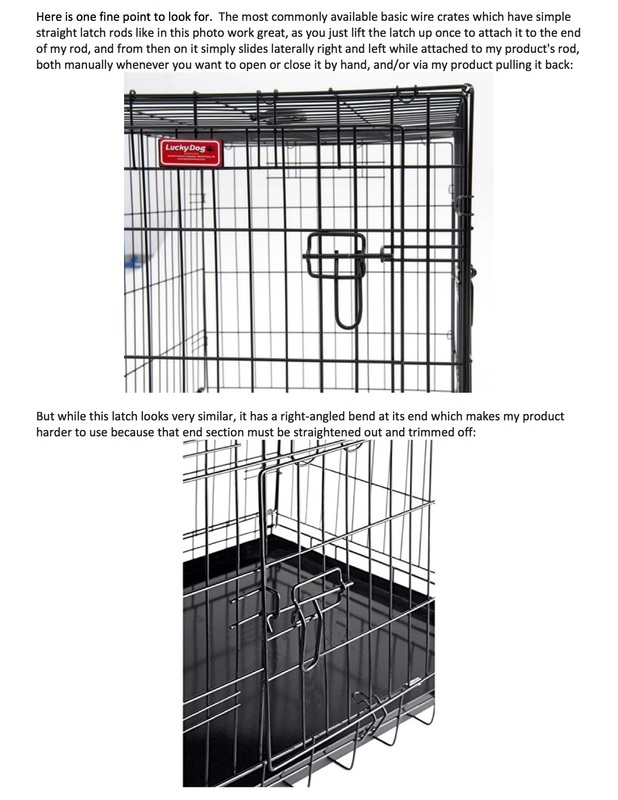 These folks are truly Top-Of-The-Line in regard to the quality, appearance, strength, and user friendliness in the world of kennels and crates. They also make the safety and comfort of the dog their #1 priority in every product they make. 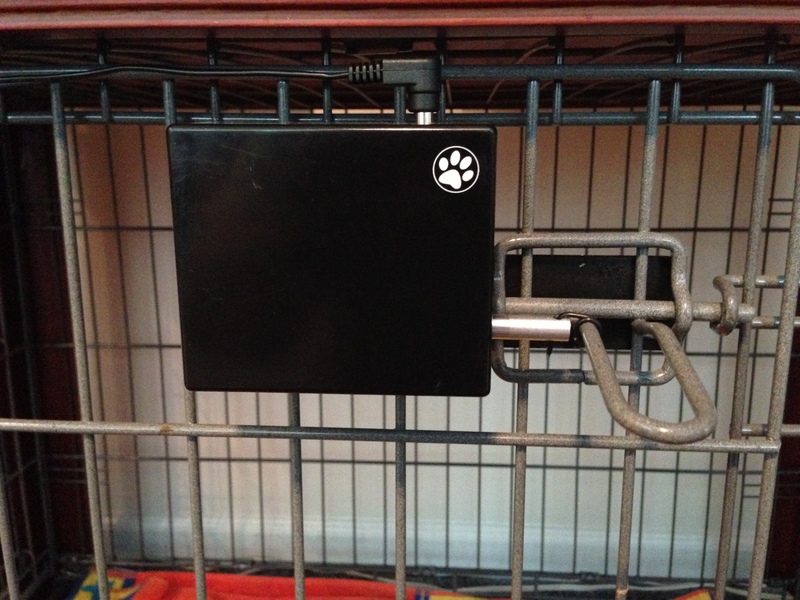 In this video, they illustrate how the Easy Out can be used to release your security dog, or any type of pet, from its crate remotely to investigate noises and such, so you don’t have to! An example would be when you hear those noises in the night that you really don’t want to go downstairs from your bedroom in the dark to investigate yourself… just use the Easy Out from your bedroom to let your faithful dog check it out for you. Any home intruder that might be trying to get in will suddenly wish they had never come near YOUR house!!! NOTE: The original base version of the Easy Out (i.e. anywhere you see if for sale without the word “Deluxe” at the end of its title) can only be activated by its hand held remote control and is only capable of running on (4 AA) batteries. The new and much improved Easy Out Deluxe may be activated by that same remote, a timer, or your smart phone. 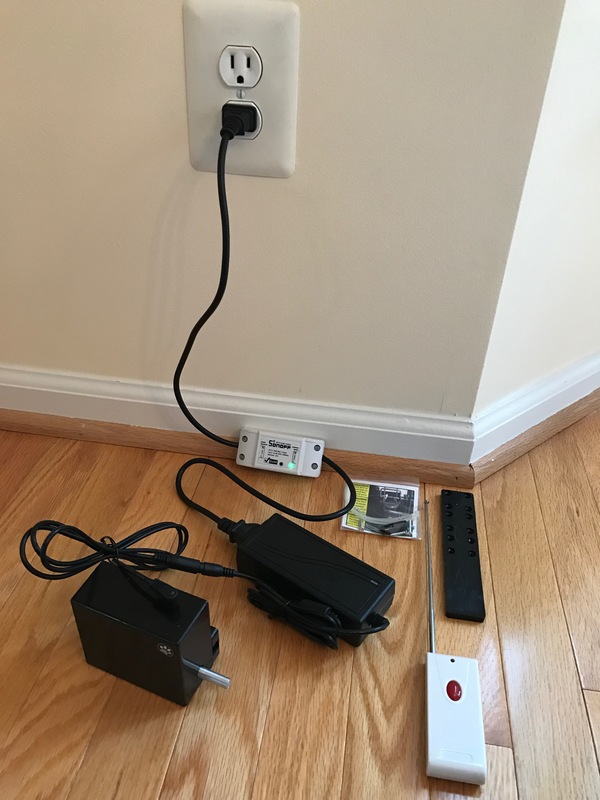 Because it is designed to be plugged in to an AC outlet, it has a much stronger and slightly longer latch pulling capability, for more robust operation. Both are available in 2 configurations, i.e. for crates, pens, or doors with 1 latch, or 2 latches. 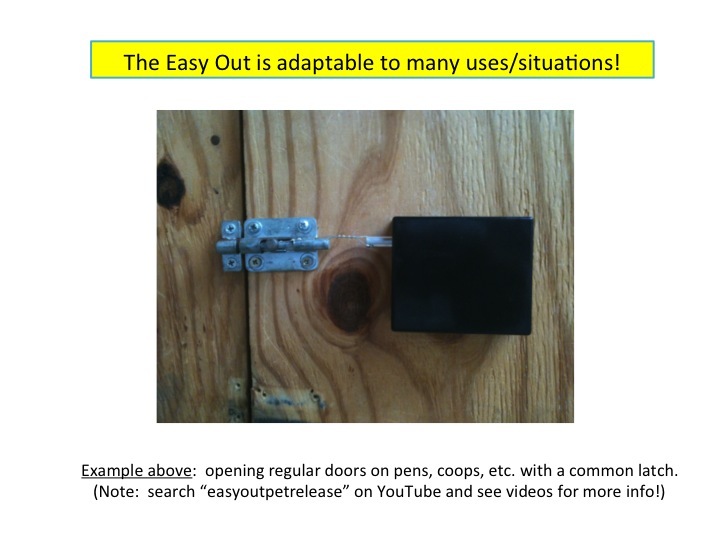 Click here to see an illustrated guide showing how the Easy Out is installed and operated. Click here to go to the full collection of 20+ YouTube videos about Easy Out / Deluxe. Important note: please check out these linked resources to make sure the Easy Out will work for your application/crate before purchasing one, as the inventor strives for all happy customers! The important thing is that it only works on latches that are opened by simply pulling them back. The Easy Out will not work on applications that require anything to be lifted, rotated, etc. unless you work around that feature. It will also not squeeze things together; however, latches of that type can be replaced with lateral motion latches to allow the Easy Out to work, as explained here! Click here to watch a video showing many different applications of the Easy Out. Fortunately the vast majority of pet crates work GREAT with the Easy Out, as well as many pens, kennels, and even fenced in lots. For example, the photo below shows how the inventor uses Easy Outs at home every day on a wood sided pen, and you can click here to watch a brief video of how it was installed and how it works. 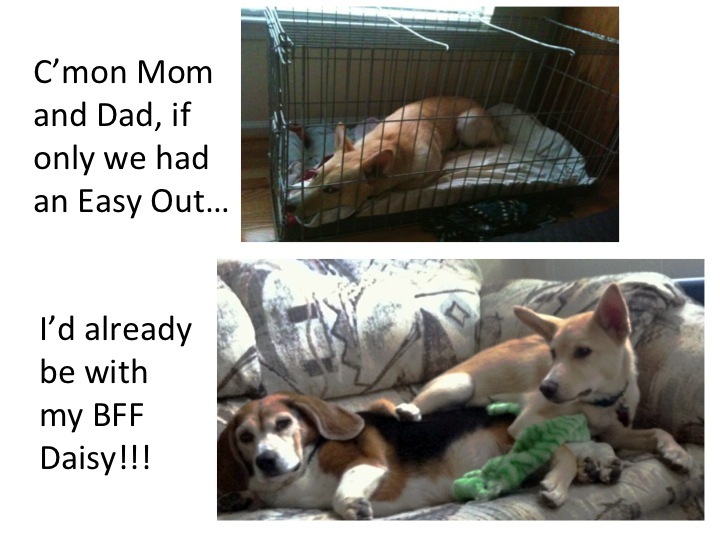 THE EASY OUT IS FUN FOR BOTH YOU AND YOUR PET! 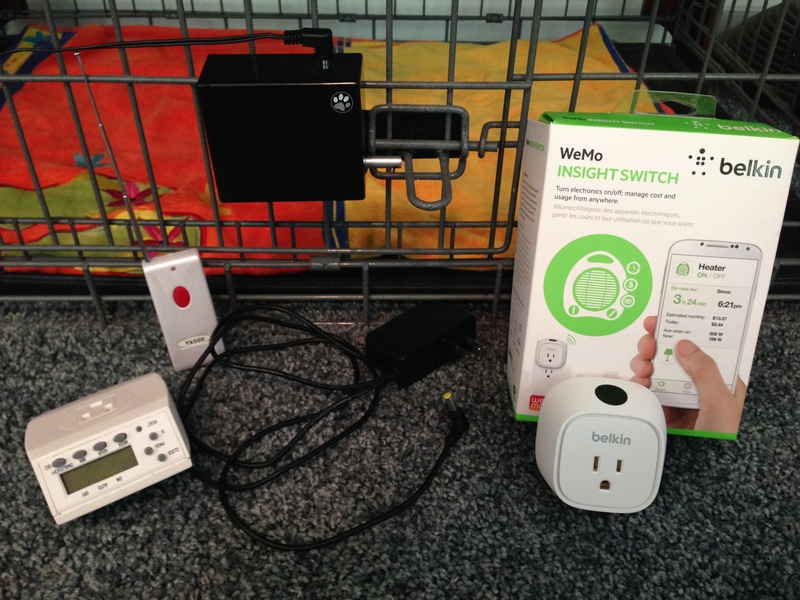 – Release your pet in the morning from multiple floors away without ever getting out of bed! No more trips in the early, dark morning up and down multiple flights of stairs or to a far corner of the house, garage, or yard. Click here to see the inventor releasing his beagle Daisy from her crate 2 floors below in the basement while he is in bed on the top floor. – Release your puppy/dog when you get home before you even get out of your car… By the time you come in he/she will be there to greet you…and with no chewed up old shoes or spilled trash, just your happy pet! In fact, click here to see the inventor opening his crate from his car a full 50 yards away from the garage. – Dogs/puppies and their masters can each enjoy their dinners in peace without disturbing each other, and then when dinner is complete a simple push of the remote button reunites everyone for play time! 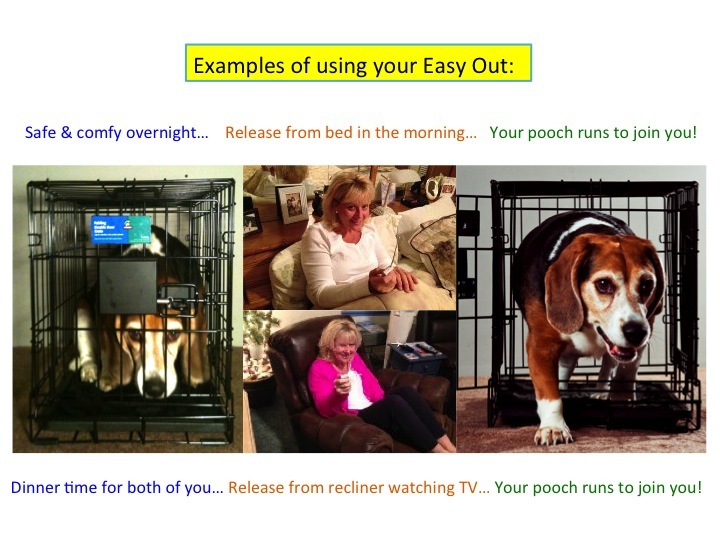 The Easy Out is the only product on the market that allows the user to release their pet remotely, and precisely when the user desires to do so. – Release your dog after you’ve gotten in your car and away from your house, so your dog won’t jump on your good clothes, follow your car dangerously, run out of your garage while you are leaving, etc. As above, click here to see the inventor opening his crate from his car a full 50 yards away from the garage. – Click here to watch a brief video of the inventor illustrating how quickly and easily it can be installed on a typical wire dog crate. – Pushing the remote button or app button on your phone unlatches the door and allows any size dog or puppy to push it open. Regular manual operation of the latch is not affected, so you can still open/close it by hand whenever desired. This means you never have to worry about it getting “stuck” or anything hindering you from releasing your pet manually during emergencies, or any time. 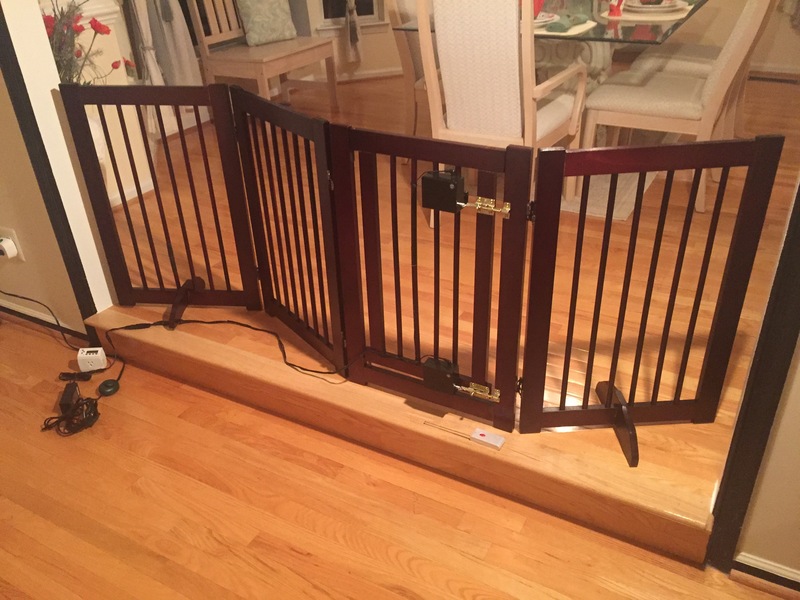 – Speaking of safety, the Easy Out can also be used to release your dog(s) from their crate(s) if you ever hear any alarming noises in the house at night… a simple push of its remote control button will allow your “watch dog(s)” to check out that disconcerting noise downstairs in the dark so you don’t have to, and scare away any potential intruders! – Great long term value; with a one time affordable purchase you and your pet benefit every day, year after year! And as your dog grows and/or the containment methods you use for him/her evolve, the same Easy Out can be adapted to work on larger crates, pens as mentioned above, or even door flaps. Click here to see many ways it can be used! Hello. I have a question about your great product…Can I use a programmable remote to control the Easy Out Release? What frequency does this operate on? We have a K9 security dog, and would like to program a key fob remote to operate the remote. Thanks very much for your post Bruce! You raise a great question. First, let me say that I am a 30 year mechanical engineer, but I’m not an EE, and I’m still learning about remote control technology as this invention was my first foray into that field. As you probably already know, the Easy Out uses RF signals, not IR, to work through walls, etc. It works at 315Mhz, which I’ve read is a very common frequency for similar commercial applications. The remotes that come with the product are fixed, i.e. 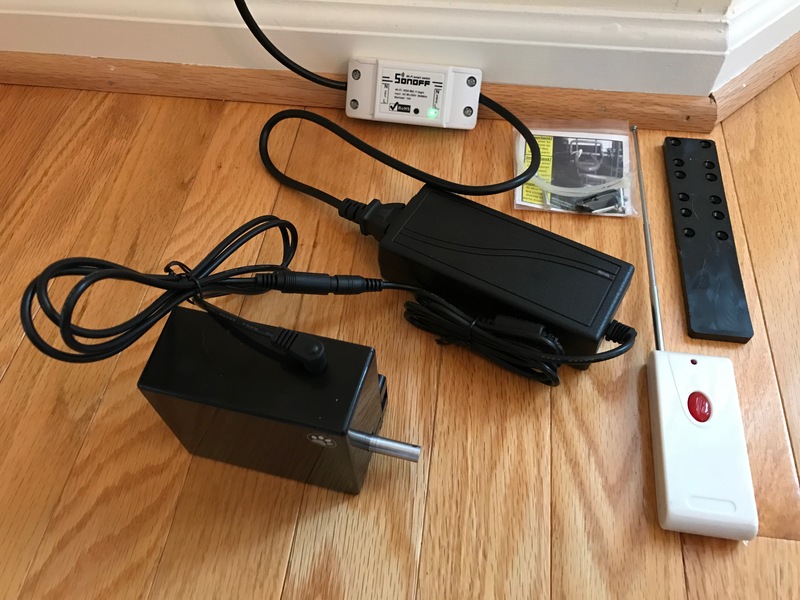 there are no switches you can set to “personalize” their signals as with some garage door openers. That being said, I did try once to “teach” its frequency to another device. My Camaro car offers buttons built into its dashboard that can be “taught/tuned” to open your garage door. I’ve successfully used them for my garage doors, but when I tried once I did not succeed in “teaching” them to open the Easy Out. I never understood why not and I have tried to learn why, but I have not had time to find that answer. I plan to try again when I get time. The 315Mhz frequency is well within the specified range, so that shouldn’t have been the problem. Perhaps you know more about this topic than I do. It would be great if you were able to program your fob to work, and let me know! As an alternative though, I have a few small key fob remotes that are matched to the Easy Out and open it, and I could send you one of them if you decided to buy the product. I can send you a picture of it if you’d like. It is small, black, has a hole for a key ring, and has a sliding cover that keeps its button from accidentally getting pushed while in a purse, etc. The only down side to it is that it doesn’t work from as far away as the larger white remotes we package with the product. It will work from at least 1 floor and/or 50+ clear feet away though, depending on obstacles, so that might be OK for you. If you’d be willing to ship it back to me if it doesn’t work out for you, and you would like, I could send you one of these small key fob remotes for just the shipping cost. Thanks again for your post! Bruce, This is Les again. I’ve looked into your question a little more now, and to answer it more succinctly I believe there should be no problem using a RF programmable fob to trigger the Easy Out. They should have no problem learning its fixed frequency of 315 Mhz. I will try again to teach the HomeLink setup in my GM car to trigger it tonight. I believe my problem the first time may have been a weak battery in the transmitter I was using to train it from. Hi Bruce… that sounds good. Since you would like the fob remote which is not in the normal packaging I can verify the operation of a fob from my stock with one of the EasyOuts I have at my home, and sell/ship you it all directly, for the same prices as the retailers charge. That way, I can be sure that the fob I send you works well with the opener boxes you receive. I will open the package carefully and seal everything back up before shipping it to you after verifying the fob. You can just pay me via PayPal. 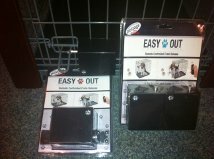 The regular prices for the EasyOuts are $79.99 for a single latch model and $99.99 for a double latch model. Which do you need? Please check out the YouTube videos via the links on this website if you haven’t already, to make sure the product will work with your crate. I belive $10 should cover the shipping. Does all of this sound OK to you? It’s always great to learn about new applications, and I’m very happy it will help you out! As for the airline style crates… I’m guessing you mean the type where you have to squeeze 2 parts together to open their latches. I showed one of them in one of my YouTube videos to convey that the EasyOut won’t open those. I don’t know of any product available which will open those. The EasyOut only provides a lateral pulling motion, which doesn’t match their design, but besides that they have pretty strong springs in them and would require quite a bit of force to squeeze… so I gave up on them. Les I need a single latch model. $79.99 is fine if you could include the shipping. (Most retail have free shipping). If you give me your Paypal info I will send the payment right away. I am removing the “squeeze” lock from the crate, and going to install a bolt type latch. Hope it works. Thanks. Hi Bruce, You are correct… I see that some of the retailers are in fact offering free shipping! I didn’t realize that, as a lot of them don’t… so I learned something myself 🙂 So $79.99 total is good. Would it be OK if I give you a call to provide my paypal information rather than post it here, and also to chat for a second about how you plan to use the product? I’m VERY interested to learn new applications it might have, and reading your post made me wonder if it might be useful for any/all folks who train dogs for security/other purposes. I suddenly remembered that in demonstrations I’ve seen of security dogs they often have 1 handler holding a dog for a period of time until it is to be released, and then the dog bursts forward towards the other handler, for example. The EasyOut would be PERFECT for that situation, because let me tell you the SECOND I hit the button my dogs come out of their crates like shots from a gun, or horses at a starting gate! So the 2nd handler would not be required to perform that activity… and I’m guessing there may be lots of times when folks in that profession might benefit from beng able to release a dog, or multiple dogs, from crate(s) remotely. If this product could be used for work purposes by an industry such as K9 training or any other industry, in addition to home use, it would be a TREMENDOUS help in growing the product! Please call me ASAP so maybe you could get it out today. Thanks! Thanks very much for your post. As the inventor of the EasyOut, hearing feedback that it is helpful for people is what makes all the effort to bring it to market worthwhile. I hope you enjoy the product in your home as much as my wife and I and our dogs have in ours!